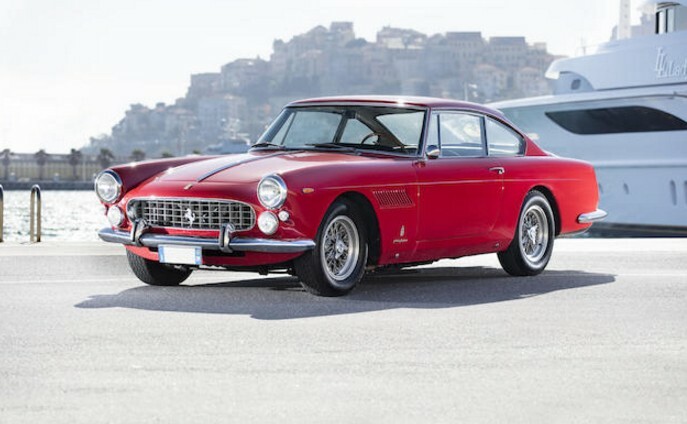 The 330 America was a Ferrari produced at a transitional time in Ferrari’s history. The brand was moving from its long-lived 250 line to the 275 and 330 lines. There was also an “America” line of cars. This is considered part of the 330 series and not part of the America series, despite its name. In fact, the car actually shares its chassis with the earlier 250 GTE. But it has a newer, bigger engine, specifically a 4.0-liter V-12 making 300 horsepower (which was based on the engine from the 400 Superamerica, hence the name). It’s a four-seater with very pretty if not aggressive body work from Pininfarina. Top speed was 150 mph. This was a one model year-only automobile, offered in 1963 only before being supplanted by the 330 GTC. And just 50 were built, with this being car #44. It was sold new (as a white car) in the U.S. and remained in North America until being shipped back to Europe in 1995, wearing a six-year-old coat of red paint from its restoration. A more recent restoration was carried out in 2001. As an exceptionally rare Ferrari road car, it should sell for between $330,000-$440,000. This is a Ferrari that still has some pretty good room for appreciation, a rare thing these days. Click here for more info and here for more from Bonhams. This entry was posted in Uncategorized and tagged 1963, 330 america, auctions, Bonhams, cars, classic cars, ferrari by classiccarweekly. Bookmark the permalink.